Autodesk® CFD software provides computational fluid dynamics and thermal simulation tools to help you to predict product performance, optimise designs and validate product behaviour before manufacturing. Solve for all modes of heat transfer, from solid to solid or from solid to fluid. Use CFD software and thermal modelling tools for architectural and MEP (mechanical, electrical and plumbing) applications. Optimise designs when you need to improve pressure drop or flow distribution. Solve locally or continue working while you solve in the cloud. 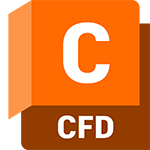 Connect CFD to Fusion 360 for CAD simplification and modification. Customisable, user-defined plane to display averaged result maps. Autodesk support specialists - You can schedule a call, chat online (limited availability) or email us. Remote desktop assistance - Get secure hands-on troubleshooting. ONLINE resources - Access our knowledge base with help documentation, tutorials, training videos and community support forums. Use your software at home or when travelling. Download and use preceding releases (available for most Autodesk products). Get exactly the software you need for as long as you need it. Subscribe monthly, annually or for 3 years. Simply and effectively manage software licences, seats and usage from your Autodesk Account. The Suggested Retail Price (SRP) shown is Autodesk's suggested retail price for the specified product and services in the United States. The SRP does not include any allowance or provision for installation or taxes. The SRP is displayed for reference purposes only, as the actual retail price is determined by your reseller. Other terms and conditions may apply. Autodesk reserves the right to alter the SRP, product offerings and specification of its products and services at any time without notice and is not responsible for typographical, graphical or other errors that may appear on this site. Autodesk makes software and services available on a licensed or subscription basis. Rights to install, access or otherwise use Autodesk software and services (including free software or services) are limited to licence rights and services entitlements expressly granted by Autodesk in the applicable licence or service agreement and are subject to acceptance of and compliance with all terms and conditions of that agreement. When you subscribe to a plan, it may renew automatically for a fixed fee on a monthly or annual basis, subject to availability. All benefits and purchase options may not be available for all software or services in all languages and/or geographies. Access to cloud services requires an Internet connection and is subject to any geographical restrictions set forth in the Terms of Service.